A year ago we introduced you to Ed Cyzewski who we’ve mentioned many times at Thinking Out Loud, but that was his first appearance at C201. We recently paid another visit and found an article we hope connects with people here. Click the title below to read at source. What did Jesus really mean when he said, “The poor you will always have with you”? 42b…As Jesus was on his way, the crowds almost crushed him. 43And a woman was there who had been subject to bleeding for twelve years, but no one could heal her. 44She came up behind him and touched the edge of his cloak, and immediately her bleeding stopped. As you know by now, for Sundays in February, we’re highlighting the website Christian Fellowship Devotions. Today we look at the writing of Janice Moser, one of the regular contributing writers at the site. Click the title below to read at source, and then navigate the site. Most of us have heard and even used the phrase, “The Buck stops here,” which is said to have originated from the French phrase “bouc émissaire,” which translates as scapegoat. During a recent election campaign, it was refreshing to hear one candidate using that phrase to accept responsibility, instead of blaming others as some national and local leaders do – even many years after those blamed have left office – and the media don’t do their job. They don’t hold them accountable, if it’s someone they like, or they are afraid of not being “politically correct.” Our Georgia governor, Nathan Deal – with whom I definitely have not always agreed – has shown true leadership in taking responsibility (even sometimes when not legally necessary, as during an ice storm for which – unlike in NY – he did not have the authority to shut schools etc.). There are so many political leaders who could learn from him. But it’s not just political “leaders” who try to cast blame on others, rather than “manning up,” as the modern phrase goes. Most all of us do it at some time or another. Having been involved in the Criminal Justice system for a decade-and-a-half, I have heard more than my share of the phrase “someone else did it,” as well as countless excuses given for committing crimes. In one case, a young man had five separate convictions of felonies – five separate Grand juries had indicted him five separate times. Five separate trials, five separate juries had then found him guilty, five separate times of five separate violent crimes. Yet his mother stood up and said “Your Honor, every time my son has been convicted of a crime, it’s been someone else’s fault.” She did not have a clue how obviously ridiculous she sounded. The discerning judge responded: “Ma’am, you can blame someone else once but not five times – and eventually your son has to accept his own responsibility. You, ma’am are part of the problem. Sit down and don’t say anything else.” The buck had to stop with the young man, but in his defense, he didn’t get very good parenting or role modeling in that regard. Isaiah 1:17 (MSG) Work for justice. And regardless of the success or failure of Earthly systems, God Himself will not accept excuses. We do all ultimately answer to Him, and he will hold us responsible for our own sins and crimes. He holds us individually accountable. With God, “the buck stops here” for each one of us. Let’s all resolve that in 2015, we will take responsibility for our own sins and mistakes, and encourage others to do so as well. Otherwise, we aren’t being honest with ourselves, others – or with God. The more people (including us) who take responsibility for their actions, the safer and healthier society we will have – and the more we will please the Lord. This appeared recently at the blog Bouncing Back, which was listed on the blogroll at Thinking Out Loud but from which we apparently had never mined an article for use here at C201. The author is Rich Dixon. Click the title to read this at source, and then take a few minutes to look around Bounding Back. There are two kinds of freedom. Freedom from allows life without oppression, injustice, tyranny, abuse, or violence. Freedom from insures my right to live my life as I wish as long as it doesn’t interfere with the rights of others. Freedom to is about opportunity to serve, to use my gifts, to make a difference in the world. I think Galatians 5:1 refers to freedom to. Freedom from, it seems, places the focus on me and my rights. Freedom from is worldly freedom. Freedom to is about what’s right. It’s about sacrifice and service. Interesting to note that Jesus willingly sacrificed freedom from. He invites us to join Him on the journey of freedom to for which He died. But let’s never forget that God values worldly justice for the oppressed, the poor, and the marginalized. Seems to me that social justice happens when those who understand freedom to deploy it, regardless of consequences, to ensure everyone’s access to freedom from. The start of the new year is always a good time to remind readers who have joined us recently that Christianity 201 is a melting-pot of devotional and Bible study content from across the widest spectrum of the Christian blogosphere. An individual article may be posted even if some or all readers might not agree with other things posted at the same blog, and two posts may follow on consecutive days by authors with very different doctrinal perspectives. The Kingdom of God is so much bigger than the small portion of it we each see from our personal vantage point, and one of the purposes of C201 is to allow readers a ‘macro’ view of the many ministries and individual voices available for reading. You might even decide to make some of these a daily habit. Any advertising appearing at the end of an article does not originate with C201, nor are we aware of it. Scripture selections almost always appear in green to remind us that God’s Word is life! Chris Lenshyn blogs at Anabaptistly and wrote what follows back in 2013, and apparently I bookmarked it at the time. Click the title below to read this at source, and then click around the blog to see what he’s been up to more recently. Matthew 25: How do we receive Jesus? This is a classic text! During a week of service with Mennonite Disaster Service, an organization which rebuilds houses and a bunch of other stuff after disasters, I participated in a bible study based on this text. At the bible study a gentleman took the liberty to add to the end of this text “… I needed a house, and you built one for me.” It was beautiful. A stunning moment as this text dynamically engaged my particular time and place. It has also inspired literary genius. Leo Tolstoy in his classic “Where love is God is also” shares a story about a cobbler who loses his faith, but finds it again in the service of people, for that is where he found God. Surely the audience of 1st century Palestine would recognize that Jesus was offering a divine social critique in this story. He lived a life that embodied this message. Serve the people of whom our society throws out with the garbage. Serve and love like Jesus did. It is a call to follow in Jesus’s footsteps, offering a love that transcends all social boundaries. It is a call to humility. 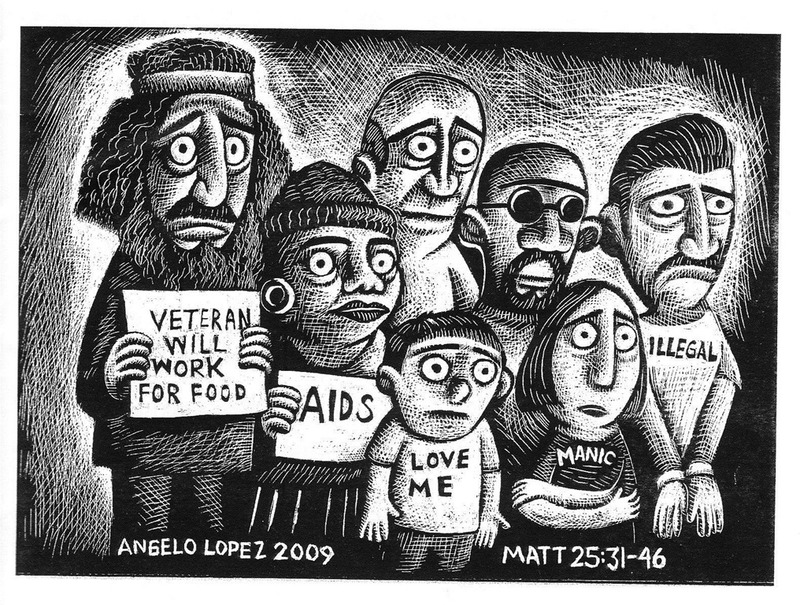 To serve those whom are the ‘least of these’ has a guilty by association feel to it. You love, therefore you are. Love, and show solidarity with the socially downtrodden and there is a high chance you will indeed share the same fate. It’s not something we do just because it is nice. The sacrifice is too great for that. Nicety can only take us so far. It therefore can’t be a ’riding in on a white horse’ superman-esque mentality. This is where Jesus digs a bit deeper. Martin the cobbler in Tolstoy’s story receives Jesus in humble service of the ‘least of these.’ That is where he encountered God. Crossing socio-economic boundaries takes a humility. Without this humility and service, the cobbler would not have seen love, nor encountered the presence of Jesus. If we are not in the place of humility, we will have a difficult time receiving Jesus. The answer, while relatively simplistic offers a back to the basics in Christian spirituality. Be humble, for there you will find and receive Jesus. The consequences of such are wholistic, being both spiritual and social. Like the gentleman who offered an addition to the text “I needed a house and you build one for me…” what would you add to the story? What does humility look like for you?